" 'scuse me sir...there's two blokes at the front door....one of 'em sayin' they're 'ere to play the organ." "The organ? 'oo the hell are they?" "The gentleman doin' the talking is from the Austrian Embassy....says his name is Count Apponyi. He says he has the authority for his associate to practice on the Willis Organ...today. He has a German accent." "We've shut off the steam.....there's barely any up. They'll have to come back another time." "I'm sorry sir, but they insist that the organ be made available at once...they will take whatever steam is available." "Bloody hell....... See them in then. We don't want an international incident on our hands. This hall has only been open a couple of months. But I want to be out of here soon." "Right sir, I will let them in." The two men enter the hall and make their way to the grand organ manufactured by Henry Willis & Sons. The shorter of the two men, round and somewhat odd looking, takes a seat on the bench and begins to play. Bach. The manager of the hall hears the organ spring to life. "You did tell him we don't have much steam up didn't you?" "Indeed sir...I made that quite clear." Music begins to fill the hall. It is glorious. Every stop is used...every pedal is touched. The few other people in the hall stop what they are doing and move closer to the organ to see who is playing it. Familiar melodies turn into improvisational journeys. "Good god lad......'oo did you say this man was?" "I believe he said his name was Bruckner....Anton Bruckner...from Austria." "Do you want me to ask him to leave? The steam is all but gone now." "Are you daft? On the contrary...start the fires back up. I have not heard anyone play like this since Msr. Saint-Saens was here a couple of weeks ago. Good god...this is incredible." As Carner points out, "these two concert-giving expeditions belong to a period of Bruckner's artistic development when he was still young as a symphonist. He was over forty when he wrote his first Symphony-an extraordinary case of delayed maturity. 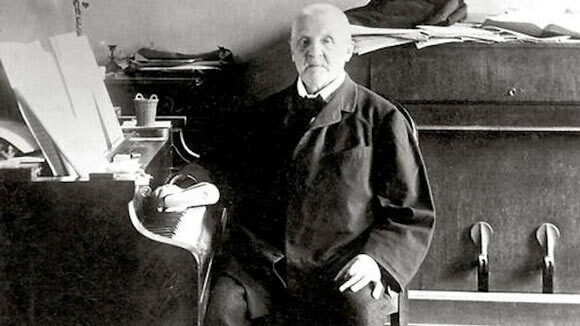 Bruckner as a composer was still practically a blank page to most of his contemporaries." Bruckner had hoped to return to London, In 1886, Hans Richter was scheduled to conduct the Bruckner 7th Symphony there, but took ill and AB himself "thought of coming to London to conduct in his place." But that did not work out. "A few trips to Germany to hear performances of his works were the only occasions on which Bruckner went abroad in later years. Moreover, organ-playing gradually drifted into the background as Bruckner began to concentrate more and more on symphonic composition. As he once put it himself: 'What my fingers play is forgotten, but what they have written will not be forgotten." Whenever I hear "Mars" from Holst's "The Planets" it reminds me of the terrifying scherzo from Bruckner's Ninth Symphony (which came first). I don't know where Anton is buried but I can imagine two headstones, one that simply says "revised". I believe he is buried under his organ at Sankt Florian. The ninth is a fascinating work....I am actually working on a new post about the Ninth. The Bruckner revision issue.....I'm not sure what to say about that! I love Holst's Planet....Mars is Bruckneresque. Thanks for reading!